1. Within those areas, of which the Defence Forces of Finland has assumed possession, it is absolutely necessary for the general population to follow regulations as issued by the military personnel. 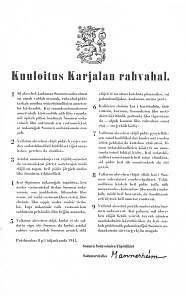 Any non-compliance of orders issued, or acts or deeds, by which it is intended to cause hindrance to the Finnish Defence Forces, or to aid its enemies, will be subject to punishment in accordance of Military Law of Finland. 2. The residents of occupied areas must upon demand, supply the information as required by military personnel in respect of themselves, members of their families, and details of their place of residence. 3. Weapons, ammunition, explosives and such war materials as abandoned by the enemy and which may currently be in possession of individual residents, must immediately be surrendered to or reported to authorities. 4. Any person who supplies to the enemy any information regarding Defence Forces of Finland, including any personnel, troop movements, or any other matter, which may be of assistance to the enemy forces, or acquires, or attempts to acquire such information, shall be penalized as a spy. Concealing or aiding of enemy soldiers will be sternly punished. 5. A resident of the occupied area, who without being a part of the military forces, and while not wearing the appropriate military uniform, commences armed operations against, or aimed at causing hindrance towards the military forces of Finland, shall not upon apprehension be deemed a prisoner of war, but a criminal, who shall be held deserving of sentence of death. 6. Destroying of any property, such as foodstuffs, cattle, fodder, buildings or forests by any means, including by burning or by other means damaging – regardless of whether property of an individual or the state, is strictly forbidden. 7. The residents of the occupied area must remain at their area of residence, and with due diligence and with appropriate care maintain their tenements and cattle. Relocating to alternative area without permission of military authorities is prohibited. In the event of the residents being issued with an order to relocate to an alternative location by the military authorities, the residents must relocate to the assigned area, and remain there. 8. The residents of an occupied area, have, alike citizens of Finland, a duty to work. In accordance of orders of the authorities, they must make themselves available and attend any seeding, harvesting, or other work, which they have been ordered to perform, and carry out any such duties with diligence and in a conscientious manner. 9. 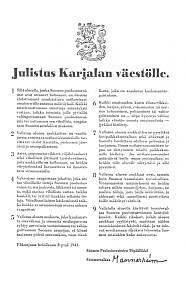 The powers of sentencing within an occupied area are in accordance of the Defence Forces of Finland Field Court Martial Any criminal act, of which the residents may be guilty of, will be dealt with under these laws, and sentencing will reflect the full and austere force of these laws.